love | Red Said What? You came into the world on your own schedule and terms. Dad and I had waited 2 years, 41 weeks and a lengthy induction for you to arrive. So as you might imagine, when the doctor finally announced “It’s a boy!” we cried tears of joy. But you laid silent. In protest, I think. As if you knew life on the other side of womb service would prove to be far too inconvenient. I watched the nurses pass you from the edge of my bed onto a table, where they fussed over your lanky, naked, ruddy body until you gave up the goods. It was only after a hearty cry the professionals felt ready to place you on my chest. They let us visit long enough for a feeding, then whisked you away to the intensive care nursery. Hours passed before we were together again. Each time a nurse showed up in the recovery room, I’d ask, “Where’s my baby?” And each time I got the same line, “We’re monitoring him. I don’t know when he’ll be ready to leave the NICU.” A brand new, wiped out and hesitant mom, I didn’t know I was allowed to go to you. In time, I found my way down the hall. The NICU wasn’t a traditional nursery where babies lined up on display behind a viewing window. This nursery had a holding room. And protective gear hanging from hooks. There was a window, but the newborns were camouflaged by incubators, IV bags and monitors. I scanned the room and spotted you resting under lights. Oxygen affixed to your nostrils, plastic lines jammed in a foot. This was the moment you became My Sunshine. My Bubbe. My son. I’ve been singing a version of the song to you every night, ever since. As we rocked, I felt like nothing could break our bond. Before you were born, Dad and I had decided to raise you in his Jewish tradition. I was raised in a Catholic one. Just after your bris, controversy ensued as to whether or not the bris was valid. Talk of dipping you in a ritual bath to legitimize your Judaism began to swirl about our home. The focus on commandments and religious law caused me to question whether you’d really feel like my child if your faith identity and experiences were different from my own. I was scared that as you grew up, this Catholic mom would feel alienated from your Jewish life. Desperate for professional advice, Dad and I went to our former rabbi. She explained what we already knew about Reform Judaism; one parent being Jewish was enough to make the child Jewish. Still, she suggested we take you to the mikveh to play it safe. “Think of it as a rebirth,” she said. I thought of the long induction, NICU visits, your protests and our rocking chair and told Dad there was nothing wrong with your original birth. There would be no ritual bath. Life went on. Daily routines quickly usurped my interfaith anxiety. Between dirty diapers, bedtime stories, early morning feedings and playground outings, Dad and I found a way to integrate Jewish customs, share my holidays and create new traditions. And I figured out being Jewish didn’t make you any less my son. I was all in. From nudging the Temple preschool director until she confirmed your enrollment and accepting a teaching job from said director a few years later, thus allowing me to learn more about Judaism, to you starting Hebrew school in Kindergarten and attending a sleep away camp which embodied Jewish values, I made sure you were surrounded by people able to give you the Jewish education I could not. Alongside the other mommies, I schlepped you to class, conferenced with teachers, filled out mountains of forms and helped with homework. Dad stepped up whenever the religious school curriculum turned toward Hebrew, Israel or Jewish history. For 12 years, I’ve watched your connection to Judaism blossom and become a source of pride. Now you’ve reached the stage Dad and I have speculated about since you were a little guy clapping along to “Shabbat Shalom” during the children’s service. In less than a year, you will become a Bar Mitzvah, an adult in the eyes of the Jewish community responsible for carrying out God’s commandments. You’ll stand on the bimah alongside the rabbi and cantor and do what Jewish teens have done for close to a thousand years; read the Hebrew blessings and prayers shared at a Saturday morning service, carry the Torah scroll around the sanctuary for congregants to see and chant a passage in ancient Hebrew from one of the first 5 books of the Bible. Bar Mitzvah prep is way out of my league. At our first orientation meeting with the rabbi to discuss how it all works, I was happy to relinquish the keys to you and Dad and listen in silent support. My silence was quickly broken when the rabbi asked each attendee to stand up, one by one and share details about when he or she became a Bar or Bat Mitzvah. I was the first person in the room to explain that I had never become one of these. As I sat back down, I dropped my head. It felt as if the NICU nurse had again whisked you away. I thumbed through your red B’nei Mitzvah binder filled with instructions, timelines, Torah portions and Hebrew blessings. Inside was a blank family tree. Part of your homework was to write down which relatives were Jewish and not to help Temple staff plan the ceremony. You’ll have to label me as “Not Jewish.” This means, when I stand beside you on the bimah, there will be certain prayers I’m not permitted to say even though I can recite them by heart. I also won’t be allowed to hold up the Torah scroll despite my strength or dress it in ceremonial garb even though I learned the tradition as a Temple preschool teacher. That’s just how our synagogue interprets Jewish law. While I respect the rules and appreciate how your coming of age is a spiritual connection to over 5,000 years of culture and community, as a mom, it stings not to be able to fully share in my son’s experience. But not converting to Judaism was a choice I made. One I stand by. And so, I closed the binder and turned my attention back to its rightful place – you. He told us becoming a Bar Mitzvah is not only an opportunity for a 13 year old going through a period of self-consciousness, insecurity and significant physical and emotional change to learn how to take on a large task, break it down into manageable parts and present in front of an audience, but also a chance for him to experience the sense of accomplishment, empowerment and confidence realized when one goes out of his comfort zone and tackles a scary task. When the rabbi said these words, something clicked. I’ve done those things. I know those emotions. During these coming months, I will connect with you through your journey, the process and the idea that you can do anything you put your mind to. 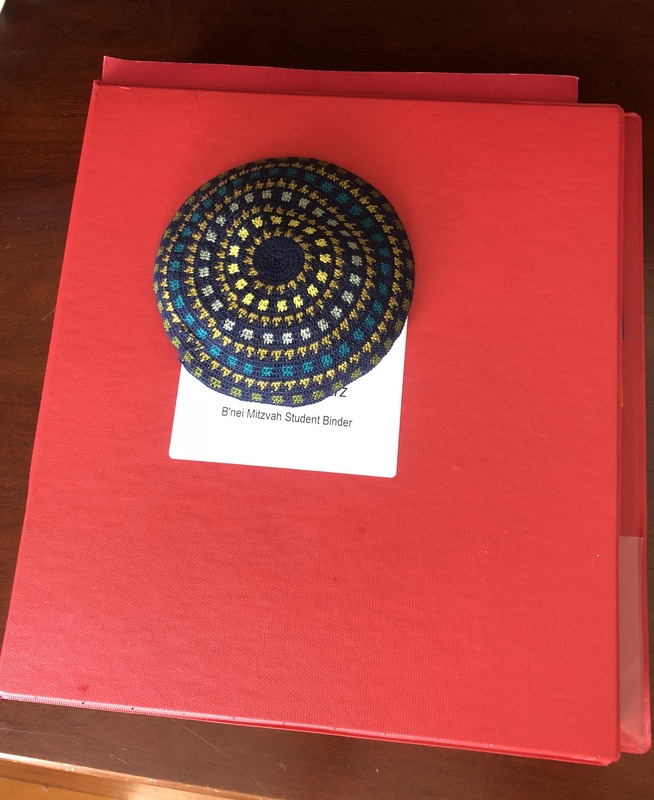 Today, the red binder lays open on your desk. You sit over it chanting prayers in Hebrew, stopping every few lines so Dad may offer guidance. From down the hall, I stop what I’m doing to listen to you sing. The afternoon sun streams through a nearby window. Its beams warm the tears caked upon my cheeks as My Sunshine’s sweet, determined voice warms his mother’s heart. God willing, I too will reap the benefits of waiting. Here you are again. Waiting. It’s what parents do, or at least what you think most mothers do, or anyway, it’s what you do. First, you wait to conceive, wait for the fertility tests to reveal what flaws and whose, wait for the drugs to work, wait for that positive pregnancy test. You try to, but can’t describe the fearful waiting through a high risk pregnancy, the anxious waiting of prenatal testing, the watchful waiting for boy number one to blossom. Wait for the right time to have the second baby, wait after the miscarriage to try again, wait for that strangle-throated boy number two to leave the NICU. Darlene is a freelance writer, educator, Speech Therapist and Children’s Book Author. Her first middle grade novel, Wheels of Change was named a Notable Social Studies Trade Book for Young People 2015 by the National Council for Social Studies (NCSS) and the Children’s Book Council (CBC) as well as awarded Honorable Mention from the Grateful American Book Prize for 2015 for an outstanding work of Historical Fiction for children. Darlene’s website is chock full of articles, activities and recipes for parents and teachers. It also serves as a resource for writers and illustrators of children’s books. Her post, “2017: A Year To Be Kind” offers resources for adults and young people who want to share stories, engage in acts of kindness, or learn about the importance of and scientific benefits to being kind. I have one addition to make to Darlene’s list: Can U Be Nice? Can U Be Nice? is a new platform created to capture our stories and “spread awareness for the need to be nice to one another.” Its goal is to empower people to choose nice over negative, kind over cold. 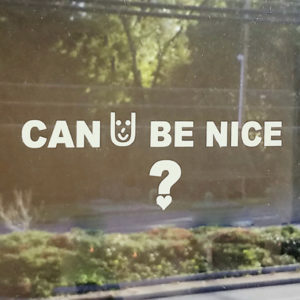 Can U Be Nice? is the brainchild of Bill Carter, a husband and father of 3 grown sons who spends much of his day observing the world from behind the wheel of his delivery truck. So the next time you are or see someone being kind or nice, share a story with Can U Be Nice? If you’re in search of ideas, please check out Darlene’s wonderful post. And if you know of a hub for kindness we overlooked, feel free to join the conversation. Let’s make 2017 the year to be kind. According to a poll by Kindness USA, only 25 percent of Americans believe we live in a kind society. In another survey of 10,000 teens, 4 out of 5 said their parents are more interested in achievement and personal happiness than in caring for others. There is definitely less kindness in public life. 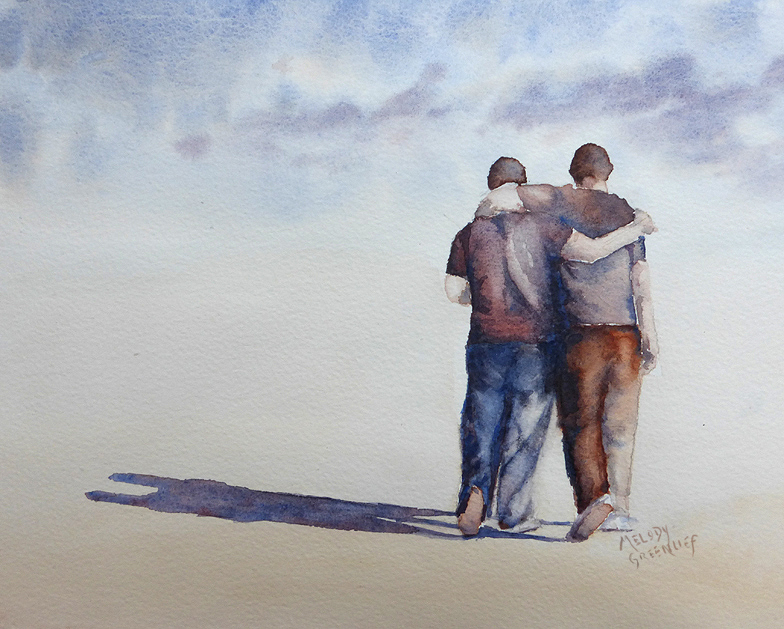 With so much harshness, negativity, hatred and meanness that seems to populate discourse in our society, it was very encouraging to see a recent article about BEING KIND. The article, by Paula Spencer Scott in PARADE MAGAZINE, lists ways we can change this discourse and make kindness a priority in our lives. Let’s wrap up 2016’s Who said what? with a Muppet post from Donna. Thank you for reminding me about this “colorful community of diverse characters who, together and individually, inspire unity through love, laughter, and song” and for putting a smile on my face. Fingers crossed for a 2017 that graces us with more Muppets, fewer puppets and a lot less clowns. The ageing comedian, known the world over for his slapstick parodies, brushed past me in the pre-dawn chill to take his place in the crowd queuing up to board the British Airways flight from Edinburgh to London. I have packing my warm jacket in my checked luggage to thank for our chance encounter. Had I not hung back to keep warm in the stairwell, I’d have totally overlooked him. As it was, before I could react beyond the chuckle that stretched my lips straight and crinkled the corners of my eyes, the bobbing head, tucked under his signature pork pie hat, disappeared into the forward motion of the crowd. Late is something I am not. Then I gave birth to Bubbe who arrived one week late and after two hours of pushing. A little guy who stopped to collect pebbles from the sidewalk, admire makeshift rivers on a rainy day, and construct block towers when he was supposed to be eating breakfast, Bubbe’s dawdling challenged my timely tendencies. The slow approach appeared to stem from his developmental delays. As a toddler and preschooler, Bubbe worked regularly with speech, occupational and physical therapists. He and I did much schlepping to services during the early years. To ensure my son got what he needed when he needed it, I planned our schedule around his clock. I laid out clothes, organized the diaper bag, and packed snacks hours in advance. I set timers, offered reminders, and built in daily dawdle time. There were days when Bubbe played along, but those were rare. “Hurry up” became a staple in my vocabulary and carrying his boneless body out the door and onto the next appointment became my primary source of exercise. After a decade of exposure to my anxious nudging and keen management skills coupled with his hard work and a little maturity, I expected Bubbe to come to value my vision of time. No such luck. This tortoise syndrome became a wider concern at the end of third grade when it led to academic road blocks. His teachers investigated. Turns out, Bubbe’s brain doesn’t send signals as fast as mine and most peers. To process, organize and focus thoughts and movements takes hard work and energy. Dawdling is part of his DNA. Armed with the information, I intended to shift my parenting approach. 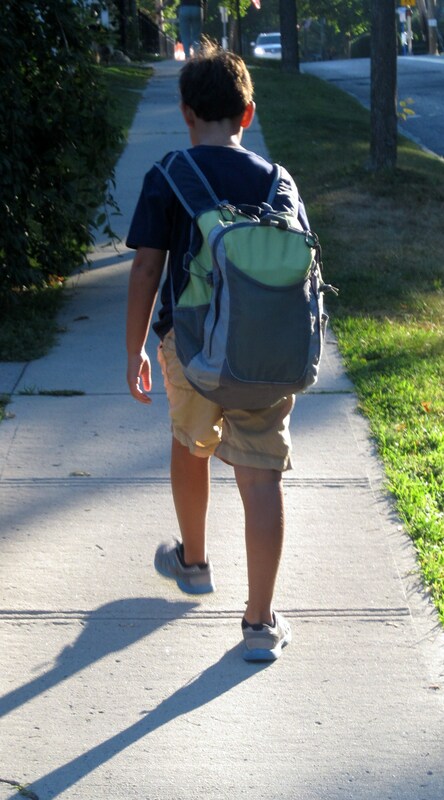 But the thought of giving my child space to figure out his day at the risk of him being tardy rattled me to the core. It doesn’t matter how Bubbe’s brain is wired. I thought. He has to learn how to move faster; use time wisely. Too big to fling him over my shoulder; prods graduated to threats, coaxing converted to yelling. I was met with eye rolls, I don’t cares and whatevers. Our home transformed into a battleground, leaving Bubbe and I frazzled and fried before the day began. Then I went back to work. My responsibilities multiplied overnight. I no longer had space in my brain to try and change his. I was forced to accept Bubbe was older and in charge of his actions. I was also forced to accept that he no longer needed me in the same way. I resolved to “do” my tween differently. Step one: let him be late for school. The neighbors knocked on the door. Skootch and I left Bubbe behind. As we walked the three blocks, I looked back but there was no sign of him. I dropped off his brother and headed across the school grounds toward the front gate. I turned the corner toward home. There he was, strolling up the sidewalk; dressed appropriately, jacket on and with backpack in tow. For the first morning in weeks, Bubbe was smiling. “I love you too, sweetheart. Enjoy the day.” We went our respective ways. And no one was late. 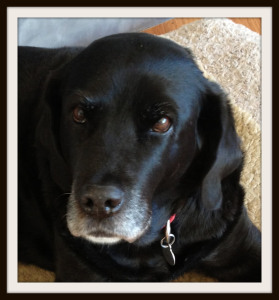 A beautiful tribute to a beloved pet. I will miss you even more. “Remember the time…” fills the house already. The practice of mindfulness has crept its way into elementary and preschools. Biologist, Jon Kabat-Zinn, coined the term “mindfulness” in the 1970s to describe the act of “paying attention on purpose” to the present moment, with a “non-judgmental” attitude. Mindfulness techniques are being used in the classroom to help children cope with stress and anxiety as well as to help them calm their mind, find center, and focus attention. Advocates believe designating school time to such training leads to improved behavior and academic performance. As a teacher, I appreciate learning the art of mindfulness to enhance my classroom management repertoire. As a mom, I welcome a daily dose of meditation as a respite for harried parenthood. But I am a grown up. Teaching preschool and elementary school aged children mindfulness is both redundant and a band-aid. Why? Because they are mindful by design and their stress is not self imposed. 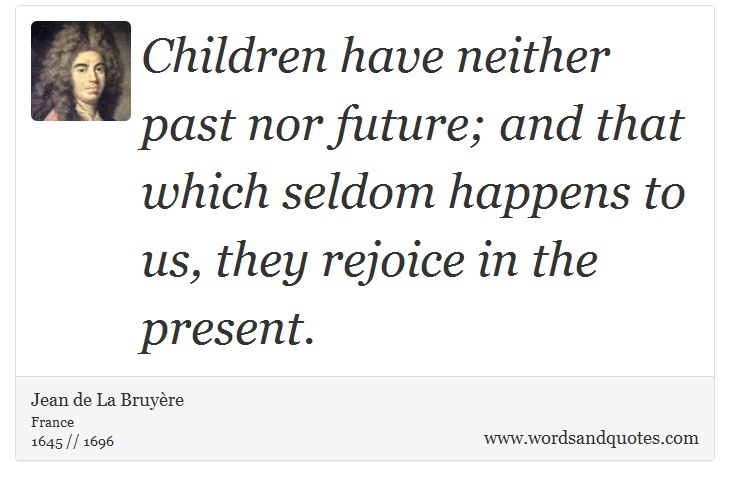 Children live in the present. Watch a 4 year old mix a leaf, grass and stone soup for the missing class tortoise or his classmate run wildly away from an invisible queen across the school yard. Stop to observe a pair of nine year olds twirl until dizzy or a crew of fifth graders so engrossed in conversation they forget to heed a busy crossing guard and it will become apparent that children are led by heart and body in the moment. Developmental psychologist Jean Piaget concluded children’s understanding of time and capacity to think in abstract terms are driven by cognitive development. A preschooler’s foundation for time begins with a sense of what happens before and after a concrete experience. His understanding of duration and the future does not match that of an adult. That’s why a child under 4 is confused by words like “tonight” “later” “today” and “tomorrow,” and will often create ones like “yestertime.” Even a child nearing Kindergarten will understand the phrase, “we are having lunch after I pick you up from school” over “we will have lunch at 12 o’clock.” By elementary school, a first grader learns to tell time only to the hour and half hour. Minutes are not introduced until second grade. While children between ages 7-10 have a more mature sense of time, abstract, hypothetical thought is not fully developed until age eleven. Up until early middle school, young people still benefit from a personal connection or concrete experience in order to make sense of a sophisticated idea. For example, after reading Crenshaw, a middle grade novel which tackles the theme of homelessness, my ten year old went on to ask questions about our family’s financial condition and whether we have enough money to pay the rent in an effort to make sense of this cruel reality. Even after I reassured him, the boy worried. Encouraging my son to read a book I, the adult with my adult view of the world, thought would benefit his growth only produced anxiety. He was not cognitively ready. Adults can minimize the stress we create for and impose upon children by limiting its source. But with poverty, trauma, and violence not as straightforward and repairable as developmentally rigorous academic standards, competitive athletic expectations, over scheduling, and the pressure to be well liked, well rounded and successful, we need to nurture their emotional health while simultaneously addressing the larger issues. But meditation, deep breaths, and mantras are not the answer. A veteran teaching colleague recently reminded me it is consistent love from a trusted adult whether it is a parent, relative, community member, or teacher that makes the difference for a child regardless of external forces. Time to move, play and socialize; time to create, discover and stretch their imagination; time to get from point A to B, be bored and to wonder. The time scheduled for mindfulness in school should be allocated to these activities because this is how children find their center. This is what helps them focus. This is what teaches body and environmental awareness. This is how they were intended to manage stress. Children are inherently present, non judgmental, and stress free. So let’s give them love. Give them time. And then, let them be.